Originally we were going to go to Windsor for New Year’s Day, but the weather wasn’t great, so in the morning we walked into town and had breakfast at Bill’s. We walked the long way home, and got back just before it started to pour down with rain. We got some jobs done at home, and caught up on TV. I also had a very therapeutic time of sorting out my clothes drawers- they had got to the stage where if I needed to put away some washing, I would put it in, push it down and then shove the drawer closed. I cleared out a bag of things for charity, and even organised my running clothes drawers- start as you mean to go on! The day after the weather was much better, so we drove up to Willen Lakes (in Milton Keynes) and had a lovely, but utterly freezing, walk around the lakes there. I’ve only been there before to run the WR 10K race, and it was good to have more time to enjoy the scenery. In the shade the paths were still so frosty and slippery. Annoyingly my back had got very stiff in the car on the drive up there so I could not walk very fast. 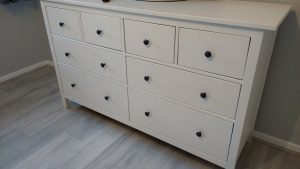 We then drove to the IKEA there to get the drawers.All we needed to do was check the drawers (we noticed that they came in white, or white wash, and we needed to see which one we actually liked) but we were in there for an hour! Argh! 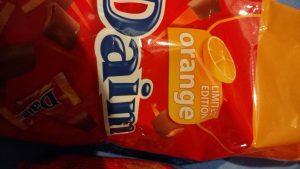 I had a little wander in the little food shop (I love their little marzipan roll things) and I was so excited to see these- mini orange dime bars! Who even knew they existed? That was our treat for the second IKEA visit in a few days. I can confirm that they taste as good as they sound. New chest of drawers for our bedroom- one drawer for hats and one for scarves instead of me leaving them on the banister/ in “neat” piles on top of furniture. 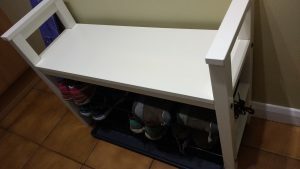 New shoe rack/ bench for by our back door (plus a shoe tray underneath to catch all the bits of mud)- for running and walking shoes. On Tuesday I was going to have a run, but my back was still not right, so I just did some gentle walking instead. 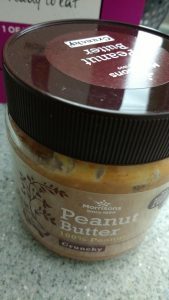 I had to walk into town to collect some online orders (I’d ordered a perfume set to be collected from Boots, and on Saturday we had missed a couple of parcels). 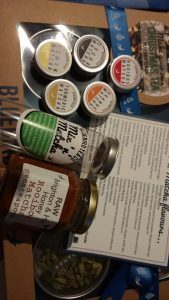 One of my bargains was a Bluebird Tea Blend your own Tea kit, plus these cute mini matcha tubs- they do a pick your own tube so you can try their flavours without being stuck with a massive expensive tin of it. I’ve had their rooibos matcha honey before and it’s delicious, so as I was ordering anyway I added it to the basket. 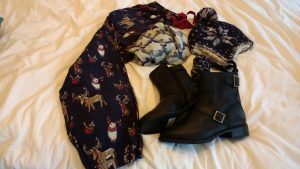 Fat Face lounge pants (I can wear festive patterns all through the winter! )- these have cuffs around the ankles so the cold air can’t get in, yet another hat, plus boots and a scarf (for the free delivery) from White Stuff. 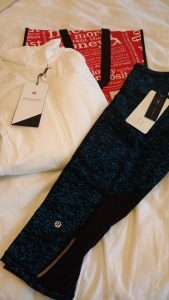 White running jacket (it’s so cosy) and capri’s from Lululemon- you still get a bag when you order online. These were very much reduced, although the prices seem to fluctuate daily- the first order I placed didn’t go through properly, and a few days later the same order was about £20 less, and now the jacket is about 4x the price I paid. Dates filled with a little peanut butter, then drizzled with dark chocolate. 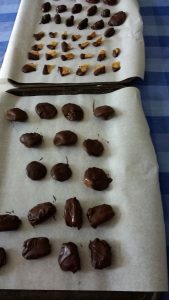 I also made some chocolate coated figs, chocolate coated brazil nuts, and chocolate dipped dried mango. They are all good, but the dates will be finished first! How was your new year? Did you get any bargains in the sales? I was thinking the other day that they used to be the January sales, but now they start online on Christmas Eve! A slightly belated Happy New Year! I’ve just spent most of the day sorting through my running gear and through the boxes of clothes I’d stashed in the loft. It was quite therapeutic. I must be one of the few people who has never been to Ikea. Perhaps 2017 will be the year I finally get to experience our local Ikea, I need some new drawers for my bedroom. I love your sale bargains. I treated myself to a couple of running tops in the Lululemon sale before my running gear buying ban started. I hope your back is feeling better today. Thanks! How have you never been to Ikea? I went even when I was little as that was where we got shelves and things from. Well, enjoy it if you go! And be prepared to spend hours there!